Our tigers been blessed with all night games thus far in the football season. This has worked out well on weekends where Andrew has to work, because he can make it home to watch the game. 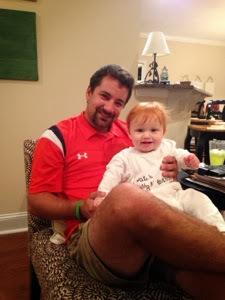 This past weekend we had Travis and Gina over to watch our Auburn Tigers take on those other tigers from LSU and eat enough food that we no longer cared about the outcome of the game. Not really...we always care...but peanut butter balls and apple dip take the edge off a little bit. We got a bunch of wings from Moes BBQ and whipped up some sides of mac and cheese, apple dip, cheese dip, fries, and peanut butter balls. Not sure who all we were making that food for...we could have fed about 15 more people. But it was yummy. And required a re-gathering after church Sunday for leftovers. Auburn boys. 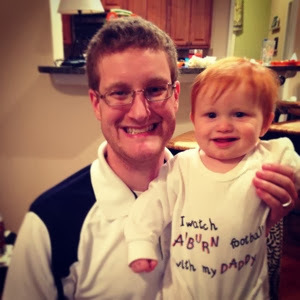 Perry is wearing a little outfit that says "I watch Auburn football with my daddy," which Andrew wore when he was little (and watching Auburn football with his daddy). The game did not go well. It was rainy and gross down in Death Valley which wreaked some havoc on our boys ability to throw, catch, punt and all the other tasks integral to the game of football. We did atleast score a couple of touchdowns and were beginning to rally towards the end. Our tigers definitely did not give up which was encouraging to see. We pulled out Perry's walker activity toy for the first time while we were watching the game. 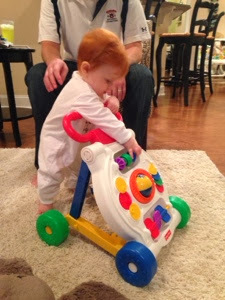 He really likes playing with it but will require a little more practice before he can really use it as a walker. It is the perfect size for him right now though. Lastly, I saw these cute little acorn snacks in a magazine last week and decided to try them out. How cute are they? 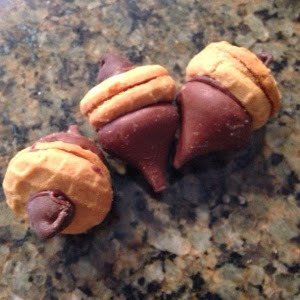 And so easy to make with just a hershey kiss, mini nutter butter cookie, and chocolate chip. All you have to do is melt some chocolate (I just melted some chocolate chips) and dab a little between each piece. Voila. Mmm. Peanut butter and chocolate. There is no better combination.